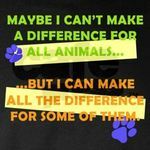 "Try to help as many animals as possible by signing and sharing petitions"
About Me Quiet, friendly and mostly optimistic. Wild Fact About Me terrified of spiders!! My Philosophy Be kind and compassionate. What Gives Me Hope Seeing the kind people doing their best to help abused animals. If I were Mayor, I'd make the world a better place by Harsher punishment for animal/child abusers.